For the first time since becoming a mum I am craving space. A little room to breathe, to move, to spend a few hours with friends, to look at myself in the mirror and not see mashed banana or vegemite sandwich smeared on my pants...or on my shoulder (a place I never see but everyone else does). And since our dryer broke the other day our lounge room has turned into toy room/music room/chinese laundry. And this morning I had a little helper who pulled the clothes off while they were still wet. 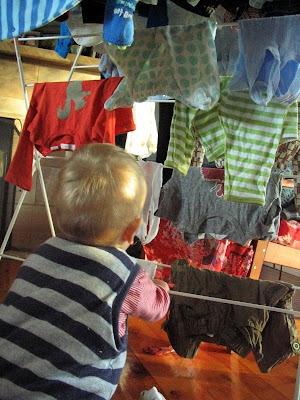 But I was patient and as any mum would, I thanked him for helping me hang out the washing. Hence there is no space in the lounge room. There is space in the shower though and this morning I relished the escapism the water offers. It was in the shower that I realised that the longest I have ever been away from my baby since he was born is four hours. Four short hours. Truth be told I couldn't wait to get back to him. And I'm sure I will feel the same next week when Daniel and I travel to Sydney for the afternoon to see this. I am so looking forward to the circus. A little bit of magic and a whole lot of body contortion. And some time for Daniel and I to be together...just the two of us for an evening. I'm sure we will talk about our little chicken for most of trip and that's ok. It is the space I am after. A few hours of feeling unencumbered. Of being with my other boy, the handsome man who has been working so hard for us. His business is so busy and it's wonderful to see him so incredibly motivated and inspired. I need to do more yoga too. Yoga for me. Balance for me. Because I love being busy...I am more productive when I am busy. But at the moment there are stories and classes and study and parenting (parenting first of course) and I want so desperately to do it all. In time it will all get done. The students will get taught and the stories will be told. This evening, instead of writing about mortgage stress or mopping the floor I am venting here and laughing at these photos. Paper doesn't taste that great. And when I look at these photos I realise how important images are. Because Che is ten-months-old now and I find it difficult to remember him when he was brand new. Just a little guy. I forget the tiny body, the little lips, the light weight of him in my arms. Thank goodness we took photos. Thank goodness the camera is always close by...so no matter how busy I am I can capture a moment. And find space behind the camera. When I was 32 weeks pregnant I invited the women in my life to participate in a blessing way for my upcoming birth. We joined hands and stood in a circle, honouring the connection created between each of us. A candle was lit by my Mum and when I went into labour I lit the same candle, reflecting on the wonderful births she experienced. The women present were asked to share a piece of wisdom to inspire and encourage me as I journeyed towards labour and the transition of birth. I distinctly remember the bright beautiful faces of my friends and the words they gave me. One friend, a midwife, told me to "...just go with the flow". Those words resonated within me from the very first contraction. An integral part of a blessing way is a blessing bracelet. Every woman present has a bracelet tied around her wrist, binding her to the women in the circle and, in particular, the mum-to-be. The bracelet is worn until the baby arrives safely. It is then cut and a blessing is sent to the new bub. I have just finished writing a story on blessing ways for Kindred Magazine. 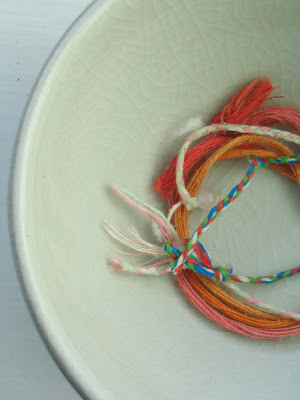 The bracelets in a bowl is a beautiful image because when I look at it I see much more than coloured thread. I see the pregnancy of three women and I see newborn babies. All three bracelets were worn by me. The green/white/red/blue (earth/air/fire/water) bracelet is Che's. The light pink with beads is the bracelet of baby Liviya Raven. And the deep pink/orange is Priya Shanti's. My blessing way was one of the most important ceremonies of my life. I believe it, along with my sankalpa, helped me experience a beautiful natural birth. As bright as bright can be is Che as he squishes and chews his vegemite sandwich. He wants to share his yummy treat but to me a flat gooey sandwich doesn't seem that appealing. And then, because I am a Mum, I start singing the song, the vegemite song...."because we love our vegemite, we all adore our vegemite..."
And before long we are beside ourselves with giggles...our cheeks are rosy and our bellys are full. It is a common fact that a baby's breath is so sweet. Che doesn't smell like a newborn anymore but when he is sleeping I often snuggle up beside him and hold him close so I can listen to him breathe. Such long, calm breaths, his whole torso rising and falling, rising and falling. His breath is still so new and pure. I wish I could bottle it. As we all grow older we (can) loose our natural flexibility and I've just some to realise that we also loose our natural ability to breathe deeply and calmly. We become so caught up in our fast-paced lives that we begin to breathe into our chest instead of our belly. We have to be reminded how to breathe sometimes. The essence of life is breath and the essence of yoga is balanced breathing. 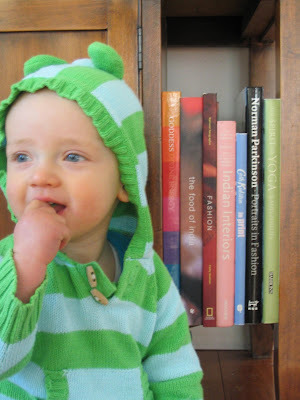 I teach all my students to breathe through their nose and into their belly - just like a baby. Today I reminded my pre-natal students that the sound of their own breath will comfort and guide them through labour and birth. 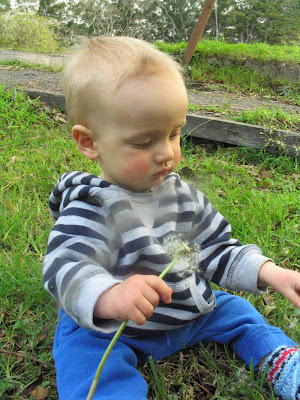 And this afternoon Che found his first Dandelion. 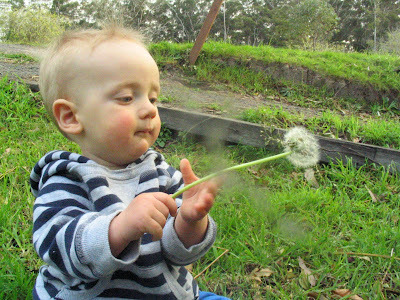 And so I picked it for him, gave it to him to hold and I taught him how to breathe softly and make a wish. He watched as the fluffy white seeds floated off into the ether and then we came inside where it was warm and cosy. 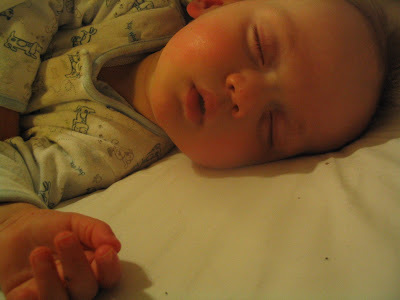 I just held him in my arms and I listened to his breath get heavier and slower until he gave in to sleep. 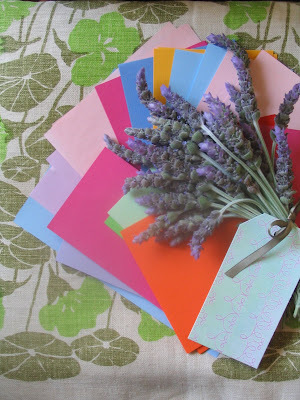 Sometimes fresh coloured paper and a bunch of lavender from Mum's garden can make a dull day seem so much brighter. 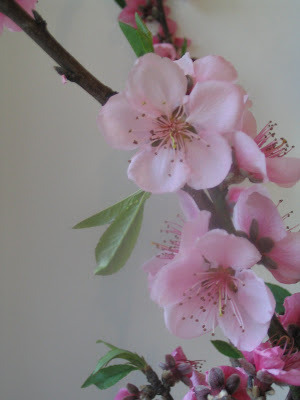 Peach blossoms carry a strong peachy scent...like a tease for the ripe fruit that will arrive in summer. They are ephemeral blooms, only lasting a little while before wilting in a vase. I found these delights in the garden of an Italian man called Manfred who lives at the end of the street. It turns out he has macadamia, mango, orange and lemon trees as well. He said I can visit anytime to collect the in-season fruit. Yes, please. So I ventured across the road to the old farmhouse, the oldest house on this street. Before I reached the gate I saw an elderly woman sitting on the verandah, looking dreamy and contemplative. I asked her if I could come in and she beckoned. I met a gem. 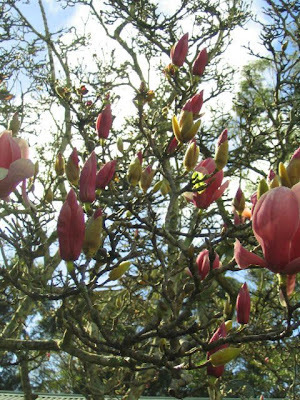 Her name is Ruth and she tells me that she often spends her afternoons sitting quietly, admiring her magnolia tree. She is an 80-something-year-old woman who loves her garden. Sadly, because of the drought and our subsequent water restrictions, she can't water her beloved blooms like she once could. So she relies on the rain to feed them and she just sits back and hopes for the best. 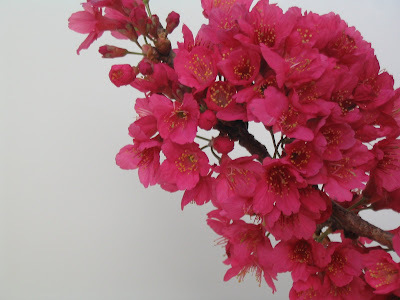 I asked her kindly if I could please have a branch of her cherry blossom tree. "You can't have just one," she says. She grabs her gardening tools and waddles in front of me, guiding me around hedges and ducking under stray branches. 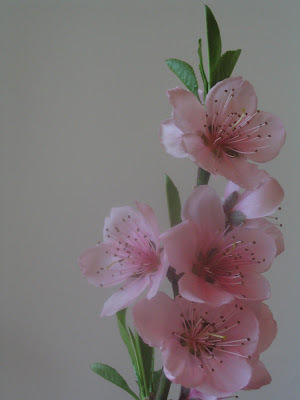 She sends me home with 5 cherry blossom branches and I promise her I'll visit again soon. I found my beloved cherry blossoms and I met a new friend. Oh spring is beginning to bloom in little corners of our world. In neighbour's yards and friend's gardens. 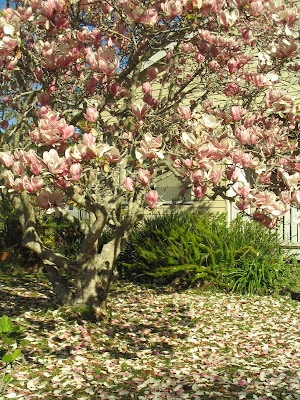 These pink camellias made my day as did the conversation with the beautiful Amber. The white snowdrops are the only kind of snow we have but we like to see the little blossoms lightly floating on the grass. And this completely made my day. Feist on Sesame Street. Counting 1, 2, 3, 4 with penguins and furry monsters. In it's 39th season, Sesame Street is really beginning to realise that under 5-year-olds are not their only audience. Hence people like Sarah Jessica Parker featuring on the show describing the word 'sigh'...and Tyra Banks defining 'struggle'. Thanks Alexandra for the link. 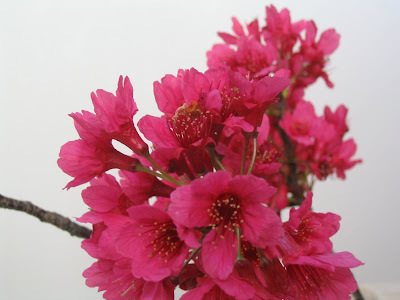 Like a mad woman I have become a little obsessed with a certain bloom...cherry blossoms. Oh cherry blossoms. White, fairy-floss pink and raspberry. Tokyo cherry blossoms. Spring delight cherry blossoms. 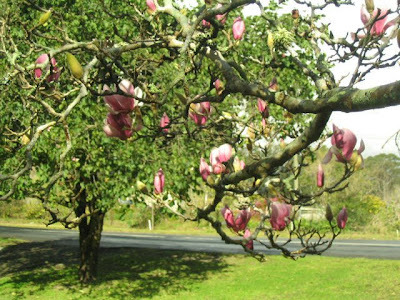 I drive along and instead of daydreaming my eyes are wide as I try to spot a blossom tree. And lucky me I have found three. In other people's gardens. Behind a fence. Tomorrow I plan on door-knocking and asking kindly if I can "please have a branch or two". Wish me luck. ...but it's nice to snuggle and cuddle and keep warm. Not long till spring. 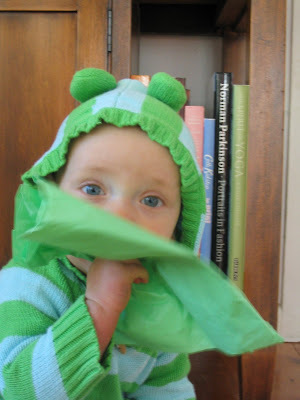 We realised the enormity of a parent's responsibility the moment Che was born. We had visualised a dark hairy baby. I birthed a fair, (almost) bald baby. We had discussed a few names that would suit a dark, hairy baby. We hadn't really talked about a name for a blondie. I remember looking at Daniel and asking: "What are we going to name him". And then I asked my baby: "What is your name, little one?". I do believe that babies bring their own name. And I believe this because six weeks before my due date I was wandering around a second-hand bookstore and I picked up a gorgeous little hardcover novel titled: "Loving Che". I bought it for Daniel. As a gift. And it sat on his bedside table for the rest of the pregnancy. Sitting there so we occasionally glanced at the words on the cover. Since I watched this film I have loved the sound of the word Che. The gorgeous Parisian, Julie Delpy, lives in a cluttered studio apartment with her cat, Che. "His name is Che, it's Argentinian for 'hey'," she says. And I spent a memorable night with friends in London where we watched this and then carried on the South-American theme by enjoying a meal of tapas and paella. The Chilean man I spent the evening with thinks it's a bit strange that we called our son Che because in Argentina it is a word that can also mean 'mate' or 'friend'. To some people in this world we have named him 'friend'. But we're ok with that. For six days after his birth we cuddled and kissed him and called him 'Bunny' and everyone around us waited in anticipation. Since he first gazed into Daniel's eyes he seemed so interested in the world around him. "He's curious Che" I said. And Daniel replied: "Yeah, curious Che. That's his name." I know that he will have to correctly pronounce his name (with a 'ch' as in 'chalk') like I have for the past nine months. I often find myself spelling C H E for people. The general reaction has been one of interest. "Oh, that's an unusual name. Hmmmm, I like it" they say. And perhaps his little friends will keep calling him what they do whenever they see us. "It's Baby Che Che" they squeal in delight. Yes, he is still curious but I suppose we'll have to wait to see if he's a revolutionary like his namesake. The story that I have just finished researching and writing is about alternative education. It seems that more parents are being inspired by the philosophy of Rudolf Steiner (Waldorf) and Montessori and are deciding to educate their children in these schools. They believe that pertinent learning through discussion and interaction with the environment is more beneficial than following a text book. I spoke with a mother-of-five who home schools and she really made me think about the role of the parent in education - we teach our children from birth...we teach them to eat, to talk, to brush their teeth, to go to the toilet...and when they turn five we "contract them out" to a school. It could be said that we teach our children from conception. I am always reminding my pre-natal yoga students that with each breath they take, they are communicating to their unborn baby - "a long, slow, calm breath is sending loving and welcoming messages to your baby". I read a post from this mum the other day and I whole-heartedly agree with her wishes for her children. She discussed a disorder known as "nature deficit disorder" - yes, that's right...children who never get to wander among the trees or splash on the foreshore. And it affects their behaviour. And it is believed that one in four 8-to-10-year-olds have never played outside with an adult. I was devastated to read such a statistic. Do we live in a society where parents are too fearful of the outdoors or are parents too fearful of the unknown? Or has the fear of 'strangers' laid to rest the opportunity for children to run free and (a little) wild? I know Che will get to wear wellies and splash in puddles, build cubby houses in the bush, eat carrots straight from Grandad's garden. I want to foster a love, knowledge and connection to the world around him. I hope that his imagination grows and grows so that he can think vividly. Daniel and I will teach him in an organic manner where he learns through experience. We will encourage him to dive into the ocean and leap to the sky. We have made a conscious decision to buy him toys that will encourage imaginative thinking and play. Yes there are some plastic, colourful, singing, twirling, light flashing toys that have made their way into our home but they will (hopefully) be the last ones. I only have to watch Che to know that he is more interested in a cardboard box than a plastic (made in China, toxins included) toy. I know that there will come a day when he just doesn't understand the decision we've made (which may result in tears) and I'm sure that we'll give-in occasionally. 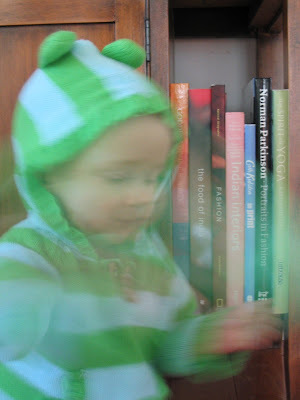 For now though, the only toys that will be accompanying him as he grows up are the wooden, organic or book variety. And I hope that they will be passed on to his siblings and, one day, his own children. After nine months of growing my baby and nine months of loving and nurturing I have realised that this parenting job is a big one. I know that our decisions will be respected by some and criticised by others. Daniel and I know that we will always be Che's first teachers...the responsibility is ours. We will hopefully teach him well. 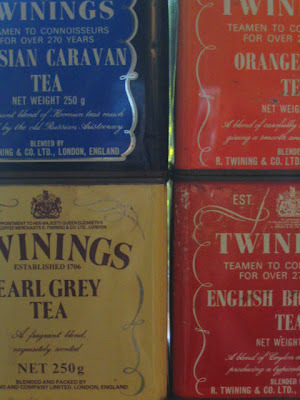 Tea cannisters found at a garage sale down the street. The perfect accompaniment to my teacups and teapots. Yes, I love tea. Picked up an Indian kaftan too. It smells like chai. My lovely round dining table sits in the small space between the kitchen and the lounge room. 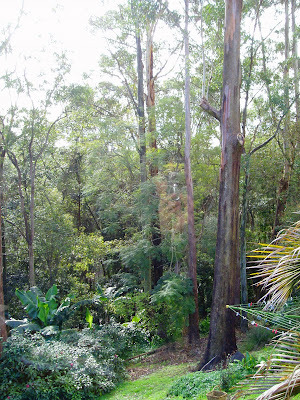 And this is the view I gaze at while I eat breakfast, enjoy a cup of tea, play on the computer. Yes, I am lucky. And you would think that this view would be the best kind of view to accompany a writer while she writes. I tend to get a little lost in the leaves and the height and the birds and quickly forget about the words on the screen in front of me. I think I need a desk like the one that belongs to this creative woman. So begins the search for the perfect little table, chair, pencil holder, inspiration board, pictures for the board. Yes, you get the idea. But really, I should be content with this stunning view, shouldn't I? 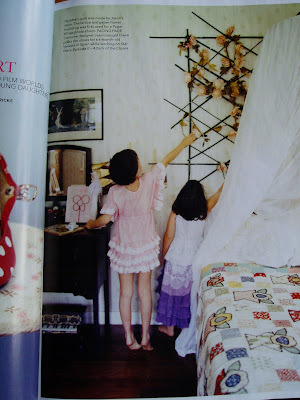 In between procrastinating today I found this gorgeous room in the latest issue of Country Style magazine...the bedroom of the daughters of Paperwings sigh sigh. Beautiful indeed. We could have walked over the hill and far away but the kookaburras began laughing and we knew that meant rain so we headed home to warm soup and bread. And here I am writing about my procrastination which, when you think about it, is actually just another form of procrastination. So be it. I feel inspired by my dreaming, my wandering, my gazing. Another story due...deadline is Sunday. No worries.